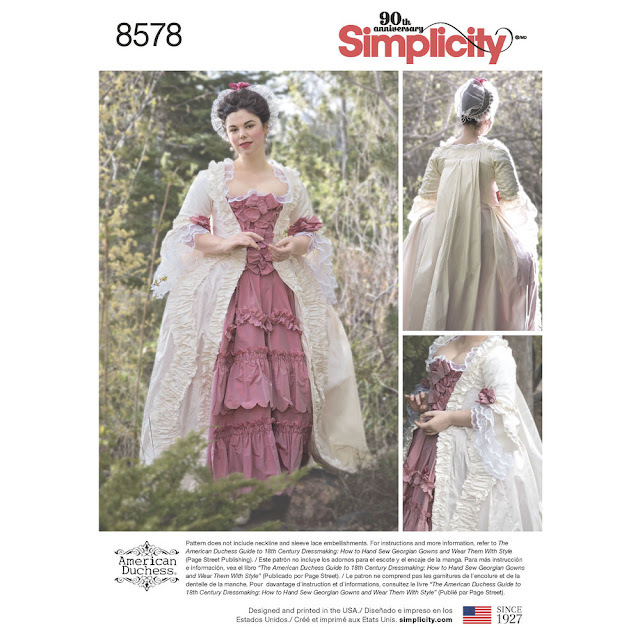 Simplicity 8578 and 8579 - TWO new 18th Century Patterns! Ladies, we are SO excited to finally announce two new 18th century American Duchess patterns from Simplicity! Simplicity 8578 is the Robe a la Francaise (Sacque) and petticoat and Simplicity 8579 is the underpinnings to go with it - shift, stays, and side hoops. 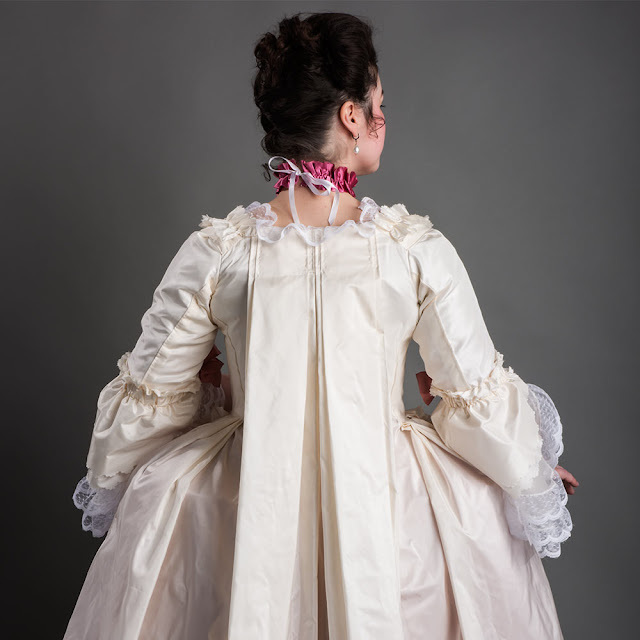 When Abby and I were writing The American Duchess Guide to 18th Century Dressmaking, we realized that readers, especially beginners, would be confused about where to get patterns for the gowns. 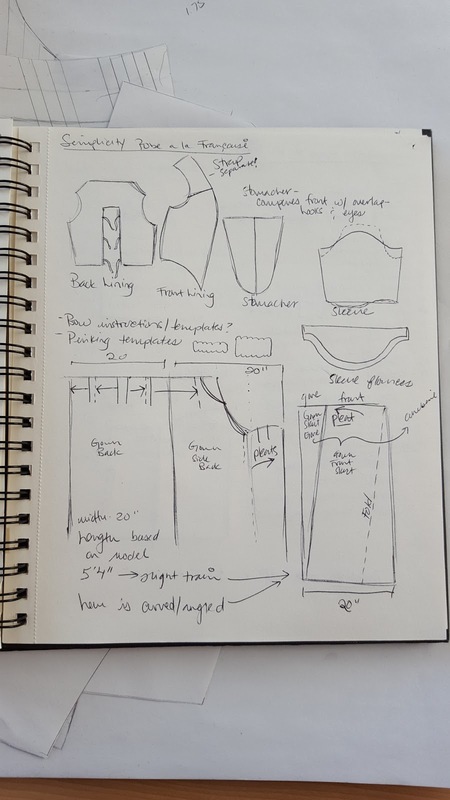 We weren't able to include full gridded gown patterns in the book, so we referenced existing patterns from Patterns of Fashion 1, The Cut of Women's Clothes, Tidens Toj, and other available sources. Even with these sources listed, though, it seemed like a natural need and next step to produce paper patterns for use with the book. Add to this the gap in our book - stays and shift - and a collaboration between American Duchess and Simplicity was born. Creating the patterns for the shift, stays, and hoops was easy. 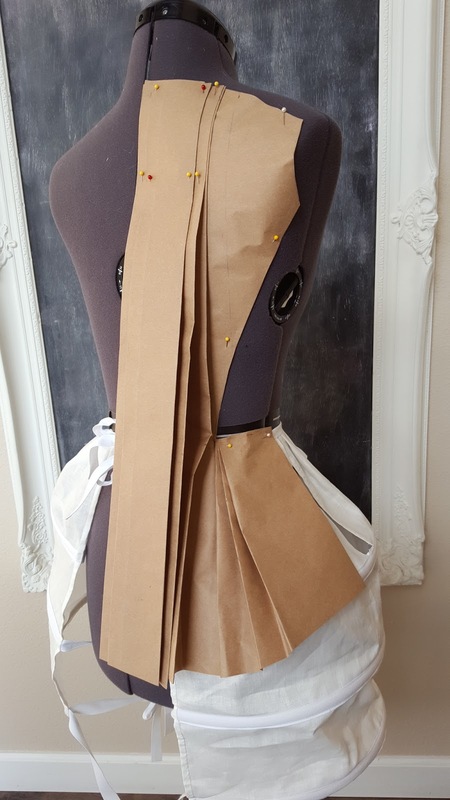 We opted for a different style of stays from Simplicity 8162 - back-closing, spiral-lacing, conical in shape, and with the awesome, accurate posture straps you're all going to love. Additionally, you'll find the shift pattern is accurate right down to the gussets and godets. The side hoops match those in the book and can be hand-sewn with the book instructions if you so choose. 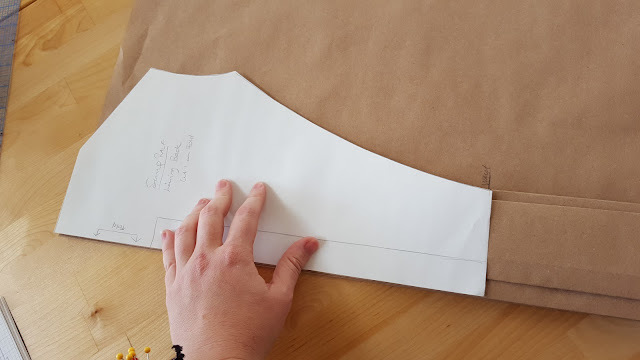 Working out pattern shapes in paper rather than fabric - easier to manage the pleats and when unfolded, mark where each pleat needed to go. Making the pattern for the sacque gown and petticoat was NOT easy! We faced challenges primarily with tissue space, finding ways to fit huge pattern shapes on only four large pieces of tissue, across all sizes. 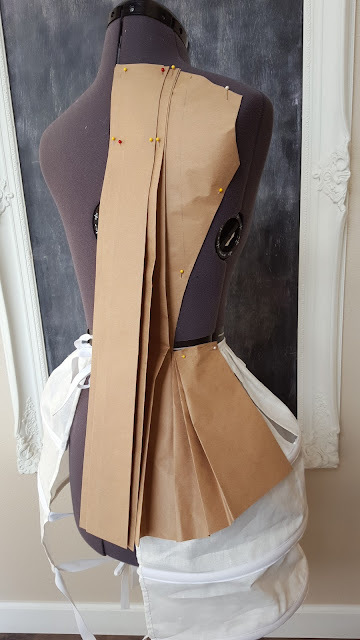 The brown paper underneath is pleated for the iconic back pleats, then I layed the gown lining back piece over to trace the shape of the armscye and side back seam, before continuing on with the waist pleats for the skirt. Starting with Abby's sacque gown lining from the book, I scaled down the shapes to a size 10 (Simplicity's required standard) and then origami'd the gown in paper onto that lining, constantly double-checking shapes and placement with the sacque made for Abby for the book. Scribbles in my notebook figuring out how to make all of this work with the limited tissue space. As always with commercial patterns, we had to make some changes to make the pattern accessible to novice costumers. The biggest change is from a pinned stomacher to a comperes front - that is, in the book we make a separate stomacher that is then pinned to both edges of the gown when dressing, and for the Simplicity pattern the stomacher closes center front and is stitched to the edges of the gown instead. Luckily, both methods are historically accurate. There are also very small changes to the trim templates and placement for the petticoat. The pattern also does not include the tucker and sleeve ruffles - instructions for these are in The American Duchess Guide. One thing I am personally proud of is the use of our own photos for the pattern envelopes. Yup, that's Abby on both the envelopes, wearing garments that were made and fit specifically to her. One of the most difficult parts of developing historical patterns for commercial companies is that we never have access to the model for fittings and no part of the styling of the photo shoot, which can leads to less-than-stellar results. We have to give a HUGE thank you to Simplicity for bending "the rules" for us this time and accepting our photos for the pattern envelopes. This way, the silhouette and proportion, styling, fit, hair, makeup, etc. is all exactly as it should be. We hope you like these new 18th century patterns. We tried to make them as historically accurate as possible, and intend for you to use the sacque pattern in conjunction with The American Duchess Guide to explore hand-sewing your gown, whether you want to try a technique here and there, or stitch the entire gown by hand. "...you'll find the shift pattern is accurate right down to the gussets and godets." I am wondering how this can be called "accurate" when you have a gown that is described as c1760's-70's worn with a shift that is 1790 plus. I assume you probably have some justification for this, but it might be helpful if you explained to your fans how and why you have rationalized this inconsistency. Thanks! Hi Sharon. The reason we went with the narrower shift sleeves is because, as a commercial pattern, this shift needed to work for a large variety of people. Some of these users will wear this shift with the accompanying Robe a la Francaise, and some will wear it with other gowns. The narrower shift sleeves avoids the problem caused when the shift sleeves are even just a little too full for the gown sleeves - I learned this one from experience - so in order to avoid that chaos, the obvious choice is the narrower sleeve. We specifically did NOT date the underpinnings packet to 1760-1770. All of the pieces in this packet work for a much broader range, just as the sacque can cover various decades depending on the choices the costumer makes. As always with patterns, the product itself is only the start of the project. It has to make up as-is with success for the user, especially the novice costumer, but it is also always our goal that more advanced costumers can use the basic shapes as a starting point and alter and explore from there. Considering all these challenges in creating a mass-produced pattern, it's the obvious choice to go with this shift design. Lastly, the pattern shapes are accurate - we didn't compromise with a drawstring neckline or omit the underarm or side gussets, and while the instructions included with the pattern are of course for machine sewing, anyone can assemble this shift by hand and have an accurate undergarment for the second half of the 18th century. I do hope that's enough of an explanation for you, Sharon. Great work on the patterns, I love that you got to do the cover photos as well! I've found that shift sleeves came in a wider variety of styles in Continental Europe than in the US. Sadly there's no European equivalent of Sharon's awesome shift research, so this is largely unknown among costumers. For instance, Garsault's "L'art de la Lingerie" (1771) describes no less than three different styles of sleeves. One of these is short and fairly narrow, and I think it would've been used under narrow gown sleeves. I've planned to cover this in some blog posts on period shift patterns next year. Could one just make a wider sleeve on their own to accommodate the earlier period? About to try a shift from this pattern in the next day or two. These look wonderful, and it's great that you were able to create the images for the pattern envelopes as well! thanks! We were so happy to be able to do that. baaabes you're killing me, I just bought the last patterns. but they look so great! congrats! and i'm glad you managed to get abby on the covers, the clothing always looks so much better when it fits well. and abby looks so lovely and serene! I am estatic to see this! Great work, both of you, and smart of simplicity patterns to pair with your book for all the interest in Age of Enlightenment entertainment that's out there! Can't wait to get these and give them a try! Especially the hoops. I never seem to have luck making them. I think its fantastic you have a 'real' person on the pattern cover rather than the usual models. Makes it so much easier to see the details and how it should fit. Still waiting for the book to arrive. SO excited. Its always pleating that confuses me with dresses so having a pattern will really help. I'm so happy you've published these patterns and I can't wait to get my hands on them! I've been slowly testing the waters of 18th century, and it's been difficult finding good patterns for someone new to the era, especially for undergarments. I can be quite creative once I have a pattern, but I can't really work without one as a base. This will be just FINE. And I just received your book (French, so it took a little time to get here). I really appreciated not only the gowns, but everything else that goes with it to create that "look". The bonnets will be treasured! I think you found a very nice place where your explanations are accessible to a beginner, BUT will still be useful years later to a more experienced costumer. Very nice work! BTW, will you consider making similar publications for other periods? Tudor, or Victorian? I'm really excited to get to work on these patterns right away! When do they come out? I went on the simplicity website and it showed the patterns but you couldn't buy them yet and it didn't say when they'd be available. Nevermind I figured it out! You're just so popular that it's backordered so I ordered it in printable form instead! So excited to start sewing! I'm so excited about these! It's so wonderful that Simplicity let you use your photos!